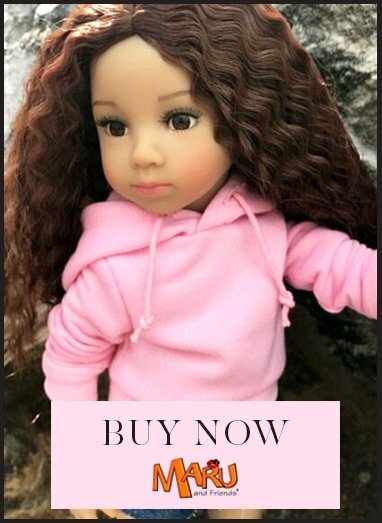 Magnificently crafted with unique, life-like facial features that look just like a little girl. She may look and feel like porcelain, but she is made from the finest materials for durable play. Valentina long curly wigged hairand a full fringe. Her baby-blue eyes, long-lashes and soft freckles enhance her innocent beauty. She wears a Chinese Qipao cheongsam dress, crafted in pink silk with delicate flowers and embellished buttons, a true celebration honoring a Chinese tradition. Dress also includes matching ballerina shoes. Please note knickers are not worn by the doll but we sell these to fit Valentina separately. Sculpted by master European doll artist, Maya Bill. Certificate of authenticity included. Valentina will be safety tested for children from age 3 but My Doll Best Friend recommends her as most suitable for girls age 5 and above as her body is vinyl which makes her less cuddly than a soft bodied doll, therefore usually better for a slightly older girl.